From left to right: Caitlyn, Sebastien, Hayley. Center: Andrew. Across the state of Washington invasive plant species cower in fear and native trees and shrubs rejoice with the mention of the Mossyrock Washington Conservation Corps (WCC) Crew. This group spends their work days traveling throughout the state tackling various restoration projects from planting native species, to removing invasives, and even trail building. What is truly impressive, however, is what they do in their free time. Instead of sitting home and letting their tired muscles rest, they head out and volunteer their time with local organizations. Recently, they have started volunteering with Capitol Land Trust and they apply their skills and knowledge of invasive species to help at restoration work parties. They first became involved with Capitol Land Trust in late November of 2015. One of the members, Hayley, had learned about CLT from a college professor and reached out to us looking for more information. With little hesitation Hayley signed up for a few of our restoration work parties and brought along some of her fellow WCC coworkers. When asked why they volunteer and what they enjoy about working with nonprofits, it is clear that they feel a strong connection with the land and they value giving back to the community. They believe that, “Land conservation is something that is very important for our natural and working lands” and they are impressed with the options that organizations such as Capitol Land Trust can provide to landowners who wish to protect their land. The members of the Mossyrock WCC have been a welcome and wonderful addition to Capitol Land Trust’s volunteer base. They bring smiles and laughs to even the wettest of work parties and their knowledge of restoration work is invaluable. 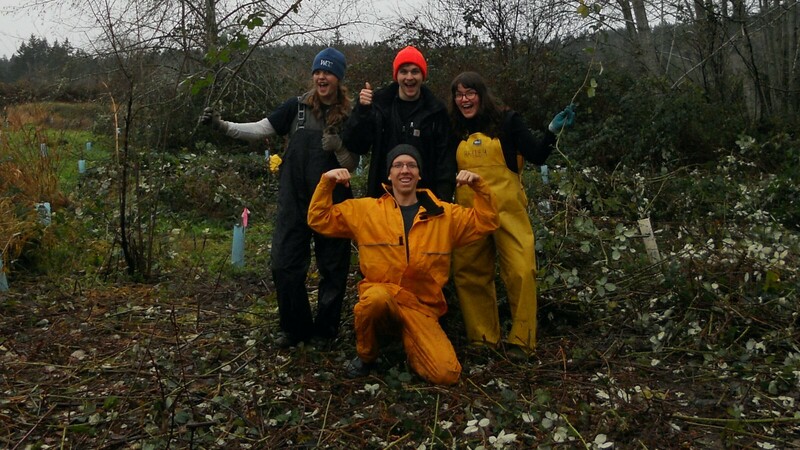 Thank you Hayley, Sebastian, Caitlyn, and Chase for volunteering your time to help Capitol Land Trust achieve its goals! We are grateful for your help!